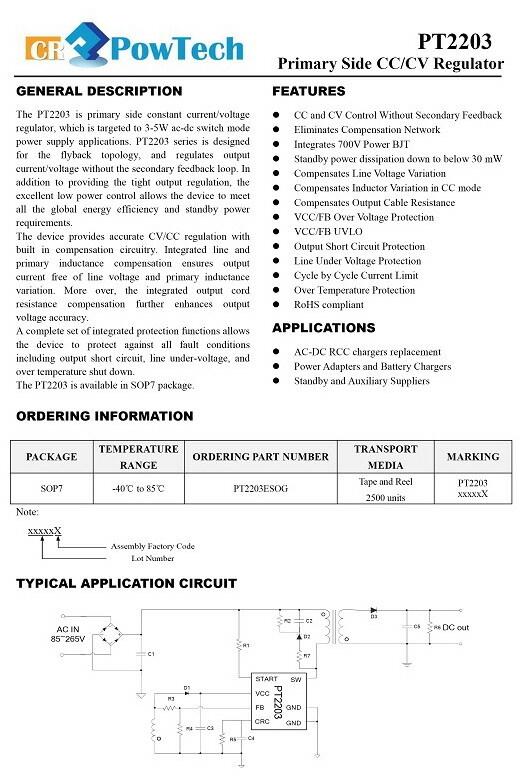 The PT2203 is a primary side constant current/current voltage regulator, targeted to applications in less than 5W AC-DC power suppliers. It is designed for the flyback topology, and regulates output current/voltage without the secondary feedback loop. In addition to providing the tight output regulation, the excellent low power control allows the PT2203 to meet all the global energy efficiency and standby power requirements. The PT2203 provides accurate CV/CC regulation with built in compensation circuitry. Integrated line and primary inductance compensation ensures output current free of line voltage and primary inductance variations. More over, the integrated output cord resistance compensation further enhances output voltage accuracy. A complete set of integrated protection functions allows the PT2203 to protect against all fault conditions including output short circuit, line under-voltage, and over temperature shut down. The PT2203 is available in a SOP-8 package.